Cephalopods are amongst the most intelligent creatures on earth. These diverse mollusks are highly organized and include cuttlefish, nautiluses, squids and my current favorite, octopus. The term cephalopod is a simple word meaning head foot, but there is a little more to them than that. 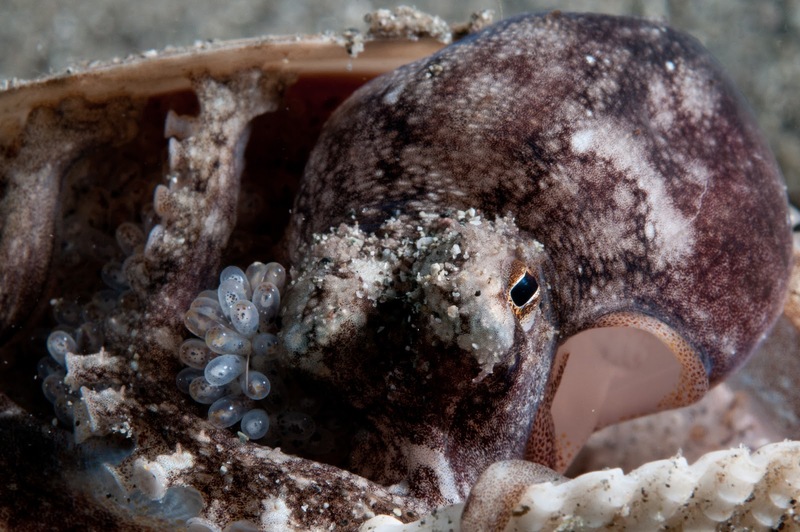 Octopuses are a bilateral creature with eight tactile arms outfitted with suction cups. Their dexterity is amazing as they grip objects while crawling and foraging about the bottom. Their favorite prey is small crabs, shrimp and other shelled crustaceans. 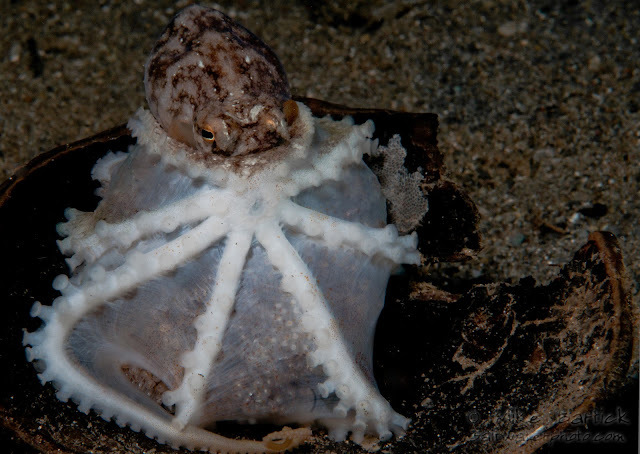 Many of the Nocturnal or night-active octopuses also eat clams and other octopus cannibalizing smaller and weaker octopus. 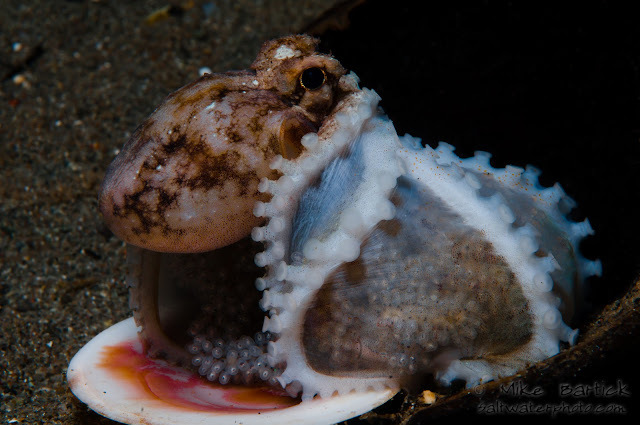 Using their powerful beaks the octopus will drill past the shell of their prey and rasp out or tear apart the flesh of its prey. Octopus are extremely agile and even the largest octopus (pacific giant octo-30 foot diameter when spread out) can squeeze their bodies into or through a passage as small as their beak. Over the years our star has evolved a special jet or siphon used for exhaling its defensive ink and waste, well developed large eyes for hunting in low light and the ability to change colors and body textures instantly for complete environmental cloaking. Often our little friends will go undetected until they feel threatened, then in a flash jetting away leaving a cloud of ink in its wake. The reproduction is accomplished sexually when the male deposits the spermataphore packets into the female’s mantle area. One of the males arms develops at an early age to serves as the reproductive organ to carry out the task. Typically the eggs are attached to a rock or in a small crevice where the female will guard them literally with her life. Eating very little during the entire gestation period, the female dies once the eggs begin to hatch. these things and be able to escape predators too. Notice that she is turned inside-out being careful not to injure any of her babies or damage any of her eggs. 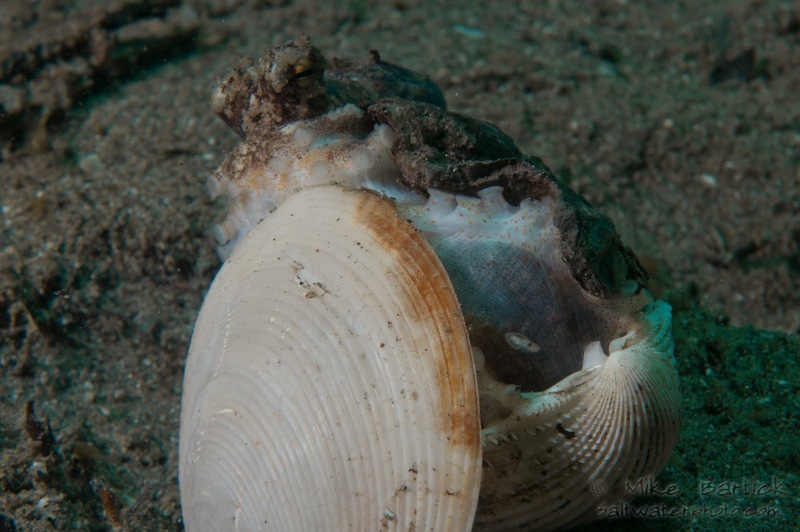 The male dies soon after depsoting the sperm packet under the females mantle. The female can hold the packet or packets until she is ready to fertilize the eggs. The female stops eating and hunting during the brooding period and once the eggs have hatched she will die becoming senescent and succumbing to malnutrition and starvation. Exhausted, this brooding blue veined octopus pears at me with somewhat suspicious eyes preparing for the "ultimate sacrifice". I returned to shoot more photos of this incredible occurrence but she was no where to be found.